WellPoint said that CEO Angela Braly will replace Chairman Larry Glasscock after he retires from the board effective March 1. Glasscock has guided the company through a period of rapid growth as it became the largest health insurer based on medical enrollment, with 33.7 million members. A statement from the Indianapolis company said Glasscock's retirement was not caused by a disagreement with the company. Braly, 48, has served as president and CEO since June 2007. 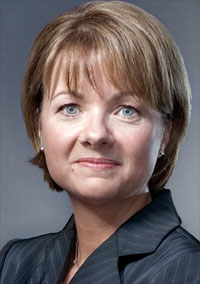 She was a WellPoint executive vice president when she was named to replace Glasscock as president and CEO. Braly's appointment as company chair was expected, Edward Jones analyst Steve Shubitz said. “I think Angela Braly has shown she is focused on the future of the company and positioning them to do well in whatever the post-reform environment looks like,” he said. A perennial contender on Modern Healthcare's list of the 100 Most Powerful People in Healthcare, Braly was ranked No. 41 in 2009. Glasscock, 61, became president and CEO of WellPoint in November 2004, after it joined with Anthem. He was named chairman in 2005. Glasscock joined Anthem in April 1998 and helped engineer the largest deal in company history a few years later. WellPoint operates Blue Cross and Blue Shield plans in 14 states and Unicare plans in several others.